The material culture developed by the Chemehuevi is very much like that of their neighbors, the Mojave, Serrano, and Cahuilla. As is usually the case, apparent differences are in part due to the types of material that were available and in part to their preferences. 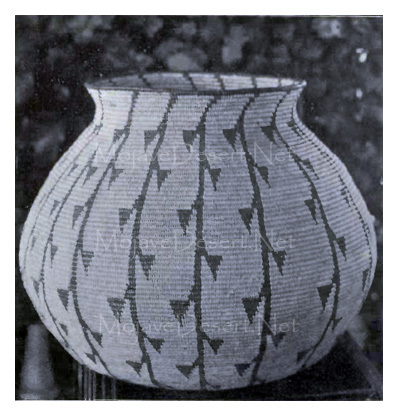 The Chemehuevi women were skilled basket makers, but made little pottery. Their coiled baskets resembled those of the San Joaquin Valley rather than those of southern California, often having constricted necks. Caps, triangular trays, and carrying baskets were diagonally twined. They usually painted designs on the baskets, rather than weaving them into the basket. They made a self-bow shorter than that of the Mojave, with recurved ends, the back painted, and the middle wrapped. Arrows were often made of cane, and sometimes willow, with a foreshaft and a flint point. Houses were shelters against the wind and sun (Kroeber 1925:597-598; Laird 1976:5). The bow used in war was sinew-backed hickory, which was very hard to draw. It was short and powerful. Another kind of bow was made of the antler of the mule deer (Laird 1976:240). Bows for hunting were made of sinew-backed willow. The adoption of the sinew-backed bow permitted the Chemehuevi to hunt big game, thus improving their supply of protein food (Laird 1976:5-6). The principle material used for houses was brush. Of the four different kinds of houses they made, one was the flat or shade house, built for ceremonial occasions. A flat roof of brush was laid across four notched posts. Another roof that sloped to the ground on the west side was built above the flat roof to provide extra protection from the sun. In addition, a very large flat house was built to hold the goods brought to a Cry to be burned or given away (Laird 1976:42-43).